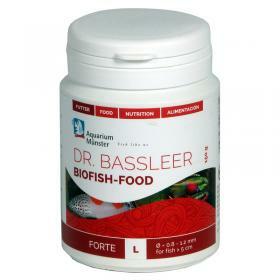 Dr.Bassler Biofish Food Forte is like a "fitness treatment" for the health and well-being of the fish. In addition to top-quality ingredients, Food Biofish contains strong immune-stimulants, such as citrus pulp, glucan quality, extracts of algae and yeast. Administer as food only every 3/4 weeks for 10 days and then resume for 30 ggcon Food Biofish regular.